A Paul Mitchell Signature Salon dedicated to providing superior salon experiences in Barton upon Humber. Xandria’s Hair is the creation of Alexandria Garner, a Paul Mitchell Signature Salon situated in the heart of Bartonupon- Humber. The salon’s reputation is built upon a platform for success which embraces high standards and quality work. Xandria’s Hair were the competition winners in The Creative Agency’s big Christmas give-away. The salon has a commitment to being the best in the area and this is achieved through a meticulous approach to every client. After an initial consultation, it was clear that Alexandria was passionate about her business, so it was really important for us to make sure that the design style reflected the company values and ethos. Ensuring we stuck to the branding guidelines of Xandria’s Hair was paramount to achieving this. 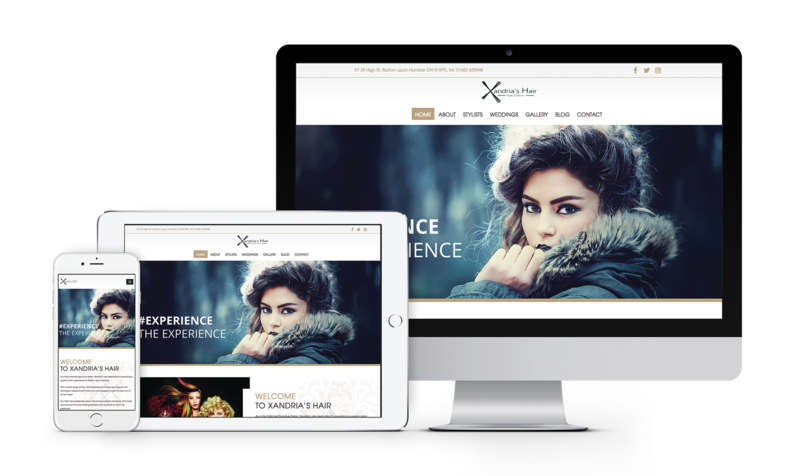 The website utilises a slick design style and is combined with the highest quality photography, illustrating the expert levels of salon styles available. Xandria’s Hair is a premium service where you receive a ‘level rated’ stylist depending on your requirements. It was important that this was clear on the website, so this is displayed on prominently on the ‘Meet The Team’ section. As with all websites designed by The Creative Agency, the website is also fully responsive ensuring the design adapts to any screen size.